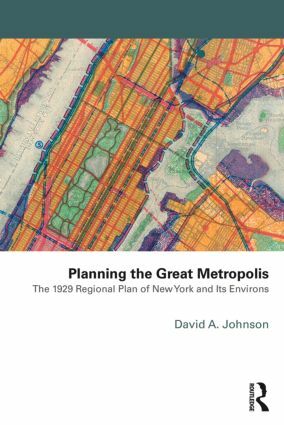 As the Regional Plan Association embarks on a Fourth Regional Plan, there can be no better time for a paperback edition of David Johnson’s critically acclaimed assessment of the 1929 Regional Plan of New York and Its Environs. As he says in his preface to this edition, the questions faced by the regional planners of today are little changed from those their predecessors faced in the 1920s. Derided by some, accused by others of being the root cause of New York City’s relative economic and physical decline, the 1929 Plan was in reality an important source of ideas for many projects built during the New Deal era of the 1930s. In his detailed examination of the Plan, Johnson traces its origins to Progressive era and Daniel Burnham’s 1909 Plan of Chicago. He describes the making of the Plan under the direction of Scotsman Thomas Adams, its reception in the New York Region, and its partial realization. The story he tells has important lessons for planners, decision-makers and citizens facing an increasingly urban future where the physical plan approach may again have a critical role to play. David A. Johnson, FAICP, is Professor Emeritus of Planning at the University of Tennessee, Knoxville. He is a past President of the Fulbright Association of the United States and has directed educational projects in Slovenia, Brazil, and Portugal. Professor Johnson also has served on the staffs of the Boston Redevelopment Authority, the Washington National Capital Planning Commission and the Regional Plan Association of New York.